Until the recent volcanic activity on the McDonald Islands, Big Ben on Heard Island was Australia's only active volcano. Fresh lava flows were observed during the 2003/04 summer, including a flow through the Gotley Glacier that almost reached the sea. Listed below are a series of questions frequently asked about Heard Island and McDonald Islands (HIMI). The brief answers given here also provide direction to the sections of this website, or other sources, where you can find further information. If you can't find the answer to your question here, try looking at the Site Map, doing a search of the site, or contact us. Where in the world is Heard Island? It’s way out there, and pretty far from everything. Heard Island is about 4100 kilometres south west of Perth in Western Australia. The McDonald Islands are about 43 km further west. That puts them in the middle of the vast Southern Ocean, about 1000 kilometres north of the Antarctic continent and still about 4700 kilometres from South Africa to the north west. The French Territory Îles Kerguelen is the closest land and is about 450 kilometres to the north west. It takes around 10 days, depending on the weather, to get to Heard Island by ship from the port of Fremantle, near Perth in Western Australia. See the Location and Geography and Maps pages in the About Heard Island section of the website for more details. What’s special about Heard Island? Where to start? Heard Island and the McDonald Islands (HIMI) and the surrounding waters are certainly unlike anywhere else in Australia, having Australia's only active volcanoes, it's highest mountain, and it's only glaciers. That's not to mention the teeming penguin, seal and flying bird colonies, which include several species with conservation status at a national and international level. The surrounding waters contain unique and important marine species, many of which are not visible from the water's surface but which play a no less significant part in the HIMI ecosystem. The entire place is virtually unmodified by human activities, which means that what’s there is about as close as you can get to nature 'in the raw'. Even though most people will never be able to visit HIMI, our lives are enriched in the knowledge that such a place exists. HIMI also helps contribute to our better understanding of global scientific questions through research and monitoring carried out in a close to pristine natural laboratory. HIMI’s special qualities are widely recognised through it's conservation status under Australian legislation and number national and international agreements. For more information, go to the Nature section and the Conservation Significance pages in the Protection and Management section. Can I visit Heard Island? Technically, yes, you can visit Heard Island if you apply to the Australian Antarctic Division for a permit to enter and undertake activities in the Territory of Heard Island and McDonald Islands (HIMI). The catch is that Heard Island is a long way from anywhere (approximately two weeks sail from Australia) and you have to pass through some of the roughest seas on the planet to get there, and back home again. Such voyages are very costly require considerable planning and logistical support. For those reasons, there are currently no commercial tour operations that visit Heard Island. Information about Australian-based companies, or companies with Australian offices, that offer voyages to other subantarctic or Antarctic destinations is available on the Australian Antarctic Division website. Like we said, this website is intended to help you get to know HIMI better, without having to get your feet wet! More information about the permits application process and requirements for visits to HIMI is given in the Protection and Management section of the website. Can I get a postcard from Heard Island? No-one lives permanently at Heard Island and there is no Post Office, so unfortunately it's not possible to receive a postcard directly from Heard Island. A Post Office did operate during the early Australian research expeditions to Heard Islandin the 1940s and 1950s. When was Heard Island discovered? There is some debate about the legitimacy of possible early sightings of land in the Heard Island region, including by Captain Peter Kemp on the Magnet in 1833 and by the captain of the Charles Carrol in 1949, but the first confirmed sighting is attributed to Captain John Heard onboard the Oriental on November 25 1853 (with discovery came the naming rights!). See the Discovery page in the History section for more details. Big! It lives up to its name, and much more so than the famous clock tower in London. Big Ben is the active volcano that makes up most of Heard Island. It is about 2,750 metres high at the summit (Mawson Peak), making it the highest Australian mountain, except for those in the Australian territory on the Antarctic continent. Big Ben is roughly circular and about about 18-20 kilometres in diameter at its base. See the the Location and Geography page in the About Heard Island section and the Landforms pages in the Nature section for more information. There are also several images of Big Ben in the Image Gallery. Yes, Heard Island and McDonald Island have Australia's only active volcanoes, and the only active volcanoes found on a subantarctic island. Volcanic activity at McDonald Island has caused the island to double in size in recent years. Minor volcanic activity was observed by expeditioners on Heard Island during the 2003/04 summer scientific expedition. See the Landforms pages in the Nature section for more information. Are the glaciers on Heard Island retreating? Like most of the glaciers worldwide, many of the glaciers at Heard Island have retreated dramatically over the last 50 years. This retreat corresponds with climate warming evident in the Southern Ocean. See the Landforms pages in the Nature section for more information. Where can I look at pictures of Heard Island? You're very close! Scattered throughout the pages of this website are images of the landscape, vegetation, wildlife and cultural heritage items of Heard Island and the McDonald Islands. For the best range of images in one place, go to the Image Gallery, which will be updated as additional and more current images become available. You may even be able to order copies of images from the Multi Media Unit of the Australian Antarctic Division – go to the Contact Us page and select Images as your area of interest. 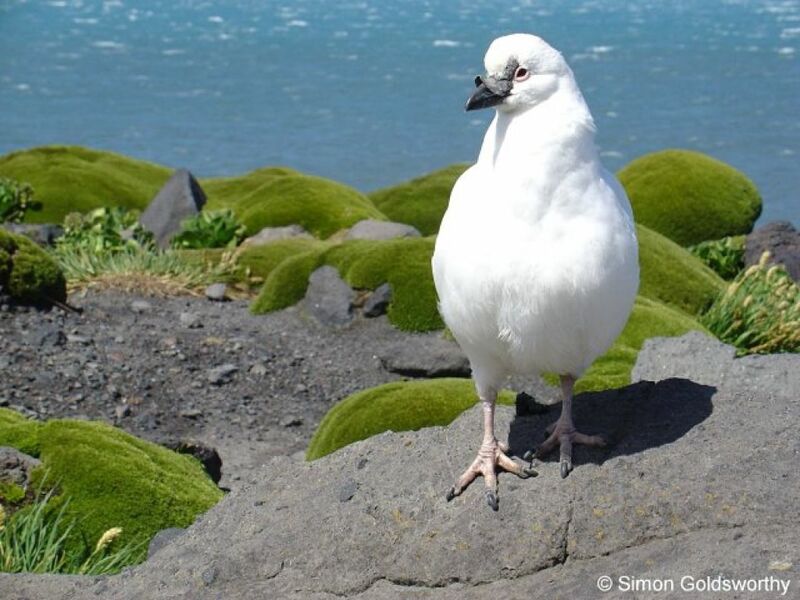 What kinds of plants and animals are found at Heard Island? Because Heard Island has a cold and harsh climate, and because it is so far away from any continental land mass (about 4000 km from Australia, 4700 km from Africa and 1000 km from Antarctica) the number of species of plants and animals present is not high, compared with milder temperate or tropical areas. However, because Heard Island is one of very few exposed land areas in the Southern Ocean, and because oceanic nutrients are driven from deeper waters to surface waters when strong currents circling Antarctica run into the submarine Kerguelen Plateau in which the islands lie, terrestrial and marine life are abundant. Go to the Plants, Animals and Marine pages of the Nature section for more information. How do people get to Heard Island? In short, by boat. There are certainly no airports at Heard Island and it is much too far away from anywhere to fly there by helicopter (see Where in the world is Heard Island? above). People and cargo may be landed on shore by helicopters, inflatable rubber boats (IRBs) or amphibious vehicles supported from a larger vessel. The size of vessels used to visit Heard Island varies, but most of the research expeditions use one of the Australian Antarctic Division support vessels. Slightly smaller vessels have been used for some commercial tourist expeditions and there have even been a few brave souls who have made the journey in yachts! More information is available on the Human Activities page in the About Heard Island section. What do people do at Heard Island? For a start, there are hardly ever any people actually at Heard Island. The highest level of activity happens during Australian Antarctic Science expeditions to the island, which generally occur only about every three years and last for around a couple of months over summer. At other times the birds and seals have the place to themselves, except for the very occasional visit by a commercial tourist group, private expedition, or periodic fisheries/defence surveillance patrols. More information is available on the Human Activities page in the About Heard Island section. The Australian external territory of Heard Island and McDonald Islands (HIMI), and the HIMI Marine Reserve are managed by the Australian Antarctic Division (AAD) of the Australian Department of the Environment, Water, Heritage and the Arts. The AAD is responsible for delivering the Australian Government's Antarctic goals (including subantarctic goals relevant to HIMI) and administers Australia's Antarctic science program. More information about who's responsible for what in the HIMI region can be found on the Management Responsibilities page in the Protection and Management section of this website and on the AAD website. What’s the weather like at Heard Island? Well, usually it's cold, rainy and windy. It does depend where exactly you are on the island, but pretty much anywhere is still cold, rainy and windy. For a more informative summary (but not one that will have you packing your bags for a summer vacation) go to the Climate and Weather page in the About Heard Island section.